Any gaps, such as those between double fire doors, must not be larger than specified by installation instructions and both door and frame must show no distortion between top, frame and stiles. 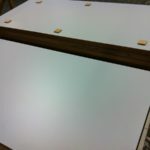 Door leaves with only minor damage may be repaired though any clearly major defects in frame or leaves necessitate immediate replacement. Cracks in vision panels require that the glass be immediately replaced – this is essential no matter how insignificant the crack may appear to be as smoke and gas can easily penetrate, preventing the fire doorset from achieving its full FD rating. The same is true when beading has become worn and damaged. Damaged or badly-fitted seals should be replaced with the same kind as in the original specification – if smoke seals require replacing, one continuous length is preferable to fixing piecemeal. Seals that have been exposed to any major rise in temperature need immediate replacement and visual examinations should be regularly carried out. 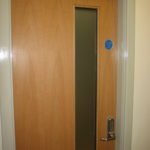 Fire doors should close fully without any binding to the floor – check that this occurs when the door closes from a variety of open widths. The door should not slam and should be closed within 10 seconds when let go from around 90 degrees. 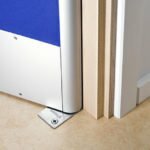 Never wedge a fire door open – fire doors with hold-open devices should have this device at the opposite end of the door from the closing device. Check that all ironmongery fixings are secure and remember that many hinges, locks and closer arms etc. may need lubrication to function correctly. Components must be replaced on a like-for-like basis to ensure consistency and a tell-tale sign of impending failure is dark markings appearing around hinge knuckles. Levers and locks should return fully to horizontal when released. These are mandatory (BS 5499 regarding standards for sighting and size of fire door safety signs), to be fitted to every non-domestic fire door at eye level. Any sign which has been removed, damaged or otherwise tampered with must, by law, be immediately replaced to ensure relevant information, such as date of installation and fire rating, is clearly and constantly visible. 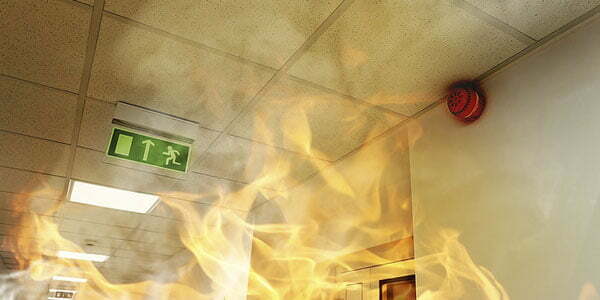 Time to replace your fire doors? Contact the BCS team now to start your journey.